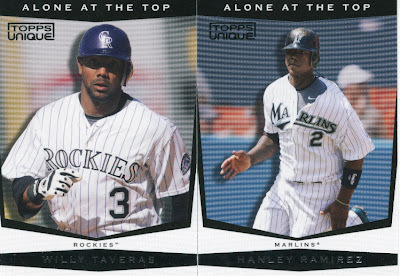 My brother (read: poor unsuspecting, had no choice in the matter brother) bought me a hobby box of 2009 Topps Unique and a Cano card for my birthday. First we will go over the Unique box of crap. I would have scanned one of the better cards I got but it seems as though I lost it somewhere in this abyss of cardboard, go f-in figure. 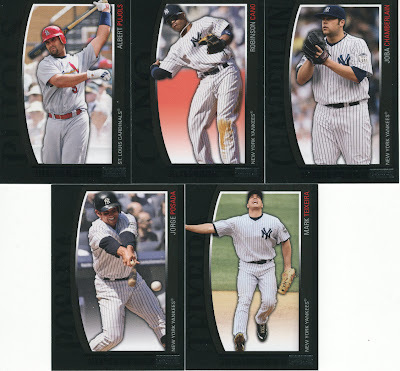 It was a Francisco Cervelli RC, serial numbered to who the hell remembers. At any rate, I opened this box on my birthday with much anticipation and excitement. Sooz called me and I opened them on the phone since I thought it was going to be a really cool box to open. Not so much. I don't have anything good to say, so as the saying goes, I will say nothing at all. Here are the "hits" if you could even call them that. Thank God I got something in these inserts that I actually like. Great news for the Hamiltonian who will eventually end up with this. 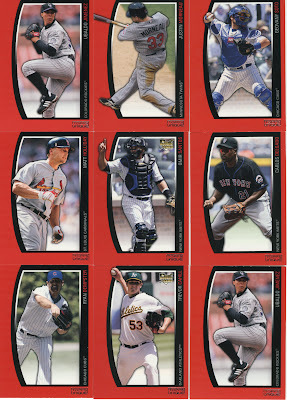 I have a knack for finding Ichiro cards, too bad I don't want them. And this P.O.S. was in the second to last pack. Talk about a HUGE let down after waiting 21 packs of crap only to unveil CRAPOLA! Viola. I'm sure someone out there will give me a pack of fruit stripes gum for this, actually maybe just a stick of it, maybe even an ABC piece. I should have listened to my brother and just picked one other card instead of picking a box of potential air. Thank God I bought this card off eBay for him to give me. He more or less had no choice in either of the gifts he bought, I bought them and he gave me the money. Makes his life easier and I get what I want. In my defense though, I picked this card up at a STEAL! It was less than $30 delivered, and if you look at what they have been going for that's ridiculous. 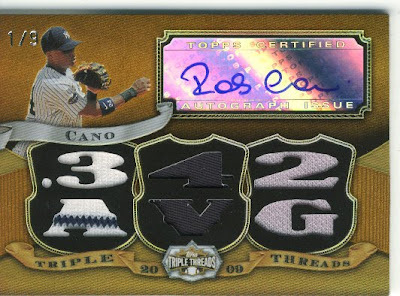 I seriously love these Triple Threads cards of Cano. The Robbie is still my favorite because it was the first one I saw and it is just awesome looking. It worked out that I didn't win the first couple of those because I like the way the swatches are on the one Sooz (outbid me on-- see yesterdays story) bought for me. Holy crap, those Unique hits were horrifying. I almost bought a box at the hobby shop today; thank god I didn't. Yikes. After seeing a couple of box breaks of Topps Unique, I don't see why anyone would spend $100+ on a box! 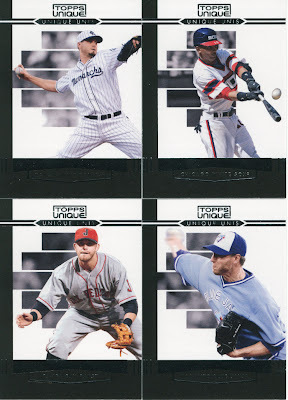 However, the black base cards, from what I can tell, are very well designed. 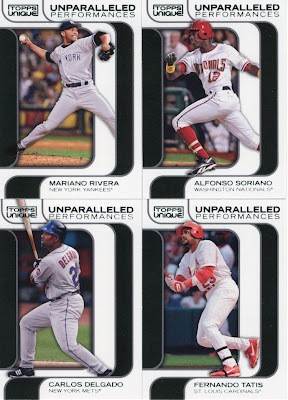 They might be the best looking base card I've seen in a long time (maybe ever). Is there a Ryan Church card in every box?! Seriously, I've seen a ton of breaks that had a Church autograph... weird. 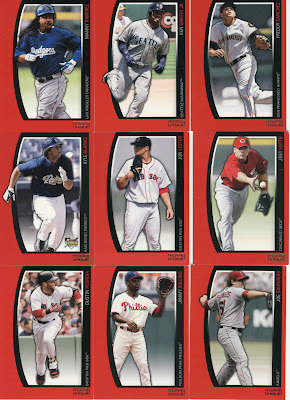 I'm tempted to try a few packs of these from my shop, but I like 'em less and less with each break I see. 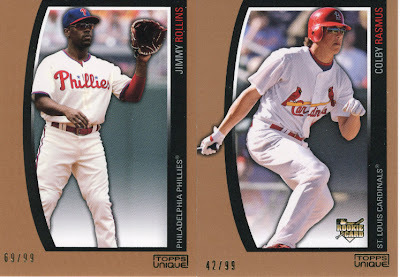 I like the base cards of Topps Unique a lot. In person they are even better looking. But the price point does not match what this product has to offer. If that box was $50 I'd be happy with it but had double that what a load of crap. A guy at the local card show this weekend had what looked like three boxes worth of Unique singles... no decent hits to speak of. In the hour or so that I was there, nobody was touching the unopened product except for some of the dealers who were buying it to bust. 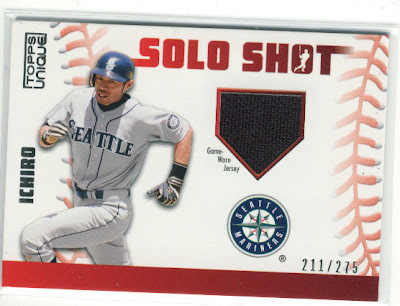 One got a case hit - a Yovanni Gallardo jumbo patch card. Yawn. The base cards and the Unique Unis inserts are nice, but the product costs too much. I think I like the Unique Unis inserts more than anything else in this product, base and hits included. Is the Longoria Unique Unis available for trade? Not sure since its was under the inserts you said you actually liked.